My neighbourhood is in transition. Thankfully, in a positive direction. An art gallery opened a block away and about once a month, it hosts muscians who live in the area. It’s a tight fit, but the music is great. 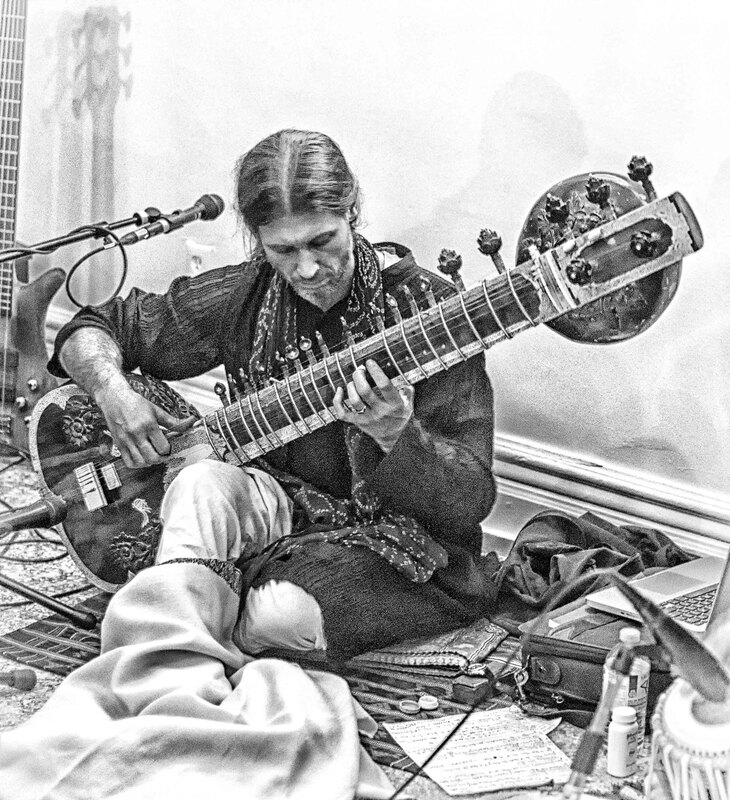 Chris Hale lives across the street and plays the sitar. When he invited me to hear him play, I jumped at the chance. As usuall, my first questions is, “can I bring my camera?” Turns out there were many who did. The lighting wasn’t great, mobility was difficult, and because we entered from the back of the gallery rather than the main entrance, late arrivals sat at the front, preventing a clean shot. Given circumstances where detailed, noise-free pictures are difficult (I don’t like using flash in these situations) I tend to try and photgraph with something else in mind. Black and white is an obvious choice as we will accept noise disguised as grain. In this photograph, I actually used NIK’s to0ls to create a more “pencil drawing” effect than a traditional B&W high-contrast shot. I did a couple of colour versions of some photographs that have a more watercolour feel to them. Another thing I like to do under these conditions is to focus on details or use “creative motion blur.” I focus in on the hands and capture the motion against a fixed instrument. I still have to process these. But most of all, I want to make sure I enjoy the music. This entry was posted in Art Photography, Event Photography, Low Light, Portraits and tagged Arts and Entertainment, Chris Hale, event photography, Fine art, low light photography, musicians, photography, Techniques and Styles. Bookmark the permalink.